Director: Jean Vigo. Cast: Jean Dasté, Dita Parlo, Michel Simon, Louis Lefebvre, Gilles Margaritis. Screenplay: Jean Vigo and Albert Riera. Jean Vigo's L'Atalante, like Charles Laughton's The Night of the Hunter, is the only full-length feature its director ever made. Also, both films belong to the small category of pictures that are so distinct, dreamlike, and ultimately unclassifiable that their essential weirdness has not dated at all, despite dozens of imitators on both sides. (One might well call The Night of the Hunter itself built around Vigo's example, particularly in the children's surreal river escape from Mitchum's Preacher.) I find it hard to watch L'Atalante without trying to account for the rapturous critical legacy that has built up around itit is the kind of film whose excellence is arguably an assessment made on the film's own merits or one that is coerced by a film with consensus critical support, despite being all but inevaluable against traditional "critical" standards. Given such confusion, I don't feel I have any chance but to measure L'Atalante by how much I enjoyed watching it, revolutionary critical practice that it is! Thankfully, though it is hard to feel one has grasped the picture completely, the pleasure of L'Atalante is in its fragile, almost web-like evocation of diaphonous experience, a time in two lovers' lives that will never return and may not even survive. 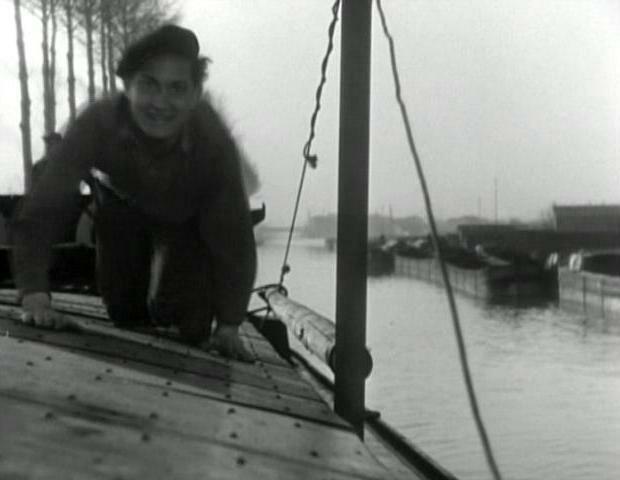 Jean (Jean Dasté, familiar from Renoir's Grand Illusion and, later, Costa-Gavras's Z) is the skipper on a barge. He has just married Juliette (Dita Parlo, also featured in Grand Illusion) and, for their honeymoonor maybe for their entire married lifehas taken her aboard his unglamorous vessel for a trip up the Seine. Their companions on the voyage are Jean's slovenly second mate Jules (Michel Simon) and Jules' precocious young son (Louis Lefebvre). The pair have trouble preparing for the newlyweds: the young boy drops a pail of fresh flowers into the water, and Jules has found no time to clean up. Jean and Juliette seem not to matter, though she is far more nonplussed when she discovers that her new husband hasn't done laundry in over a year, and that the dozens of cats onboard the ship freely bear new litters in the kitchen, on her bedsheets. The film's most charming but strangest running gag is that new felines are constantly emerging in every shot, from around every corner and under every table, a more benevolent precursor of the monkeys aboard Kinski's raft in Aguirre, the Wrath of God. What follows is an hour and a half first of awkward social dynamics aboard the bargeJean and Jules sometimes adore and sometimes repel each other, Juliette can't seem to decide if Jules is crude or cuddlyand then, after a series of misunderstandings and jealous eruptions, an unforeseen separation of the honeymooners. If L'Atalante has anything like a precursor, at least insofar as I'm familiar with, it would be Murnau's extraordinary Sunrise, in which dichotomies of rural/urban, land/water, man/woman all generate a narrative almost out of the thin, resplendent air of Murnau's romantic imagery. L'Atalante works on similar principles: we tend to understand how the characters are feeling based on how we react to what we are seeing, much of which is both beautiful and strange at the same time. And yet, there is nothing of the archetypal to L'Atalante as there is to Sunrise, which makes its pleasures (at least for me) less concrete, but which also mirrors nicely the uncertain future of the young couple, who seem very much in love but also very hot-tempered. The picture is so delicate and elliptical as to invite dream or memory analogies, but the memory could be that of a long-ago love that collapsed or one that survived.